Prom limo hire is the number one prom company in the UK with over 35 limousines on our fleet we guarantee we have the largest fleet of vehicles in the UK. Not only do we have the largest fleet but our limousines are all kept in prestige condition and are some of the best looking and new limousines to date. We understand your prom night in Nottingham is one of the biggest occasions in a school person’s life; it is a celebration of moving on to bigger and better celebrations and looking forward to a good career. Our limousines range from 8 passenger limos all the way to 16 passengers and with leather interior in every single limo you’re sure to have a comfortable ride no matter which limousine you may pick. Parents need not fear as our chauffeurs are some of the finest drivers around in the UK and all have driven buses and limousines before which ensures the safety and security we take when choosing our drivers. We want your prom to be the most special night you ever have and unlike some limousines companies who don’t insure their vehicles, ours are 100% insured and coifed and meet all the regulations set by the NLCA. When booking with us you are guaranteed to arrive in style and safety. Nottingham is a huge city with plenty of schools around, we have built a fantastic relationship over the years with certain schools and they use us year in year out. You have spent all that money on getting your perfect dress and tuxedo so why ruin it by hiring a tacky limousine. When you hire from Nottingham Prom Limo we guarantee you will not be disappointed, furthermore we provide a service which nobody in Nottingham can match. We also have a depot in the Nottingham area so you are more than welcome to come view our vehicles and see them in full life form rather than a picture. 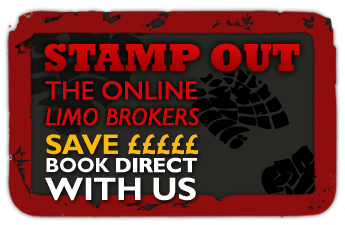 We also ensure every picture you see on our website belongs to us and they are in fact our limousines. Unlike Brokers who take pictures from other limo companies and you will not be guaranteed your dream limo and anything could show up on the day of your prom. Always book direct with us and you will not be left disappointed. 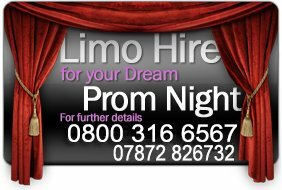 Prom bookings in the Nottingham area fill up very quickly due to the amount of schools so please do book in advance for your Nottingham prom as spaces fill up very quickly and we wouldn’t want to see anyone disappointed they could not hire their dream limousine.